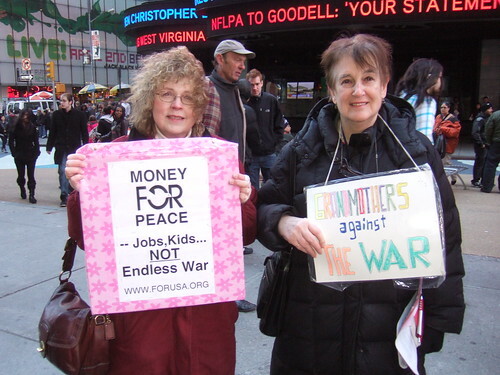 Veterans for Peace local 34 New York City chapter, Grandmothers Against the War, Catholic Workers, War Resisters, and others rallied Saturday at Time Square to end the war in Afghanistan and the occupation of Iraq. This was an adjunct event in support of the national Veterans for Peace action at the White House on the same day and also was in support of whistle blower Bradley Manning. There were speeches, entertainment and camaraderie. In a very visible area of town, the rally had the approval of most of the passing crowd. For more of the flavor see my End the War in Afghanistan 03-19-11 photo set on Flickr.com. Suggested reading, a book I bought several months ago which I am pushing to the top of my to-read list: David Swanson's WAR IS A LIE. If it is as good as David's interviews -- and I think it is, it provides tools to refute the nay sayers. Yes, it is possible to end war but it certainly is not easy. Bottom line, we have to keep on keeping on. And don't forget to leave your comments for peace at the White House contact page. Thanks for all YOU do for true peace and real justice. PS Sam Oast and I went out afterwards and remembered our dear departed Betty Lou Hornick. 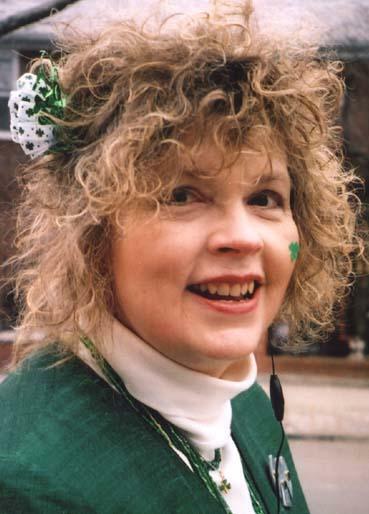 She is missed and not forgotten -- with us in spirit, no doubt.